500 Internal Server Error: What is it and How to Fix it Easily? 500- Internal server error is usually seen when something goes wrong on the website’s server. So, in most cases, this error is more serious for the website administrator than for us, normal users. If you are a webmaster, just click here for advice as to how to fix it. For us normal users, the 500 Internal Server Error could come in different forms. This is because each website is allowed to customized the message. But the status code 500 will not change. 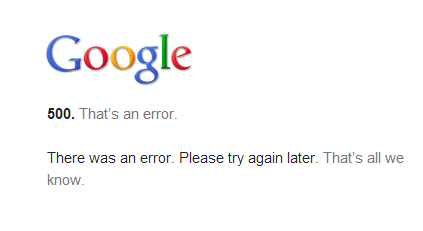 As mentioned above, this message usually indicates that something goes wrong. The “wrong” here usually equates to an issue with the page or site’s configuration. But that is not always true. There are times that this problem could be at your end. Next in line, we are to discuss some general methods to fix the 500 Internal Error. Press F5 to refresh the targeted web page or re-type the URL into the address bar again to reload the web page. Or simply try again later. Then problem can be gone by then. NOTE: If the 500 Internal Error occurs when you are in the middle of buying something online, please make sure that you don’t submit two or more orders, thus with multiple charges. Sometimes, the 500 Internal Error could be fixed once you delete the cookies associated with the site that you are getting the error on. For more information, please visit this page here to see how to delete cookies on Chrome. When you finish deleting the cookies, restart your browser and try again. It is also suggested that you contact the website administrators to let them know about this issue with their site. They may be more capable of providing you with the exact solutions. Send them an email, or a private message on Facebook or Twitter as you will. They should not be so hard to get to. NOTE: If you encounter 500 Internal Server error on our website, please send us an email to <support@drivereasy.com>. We will send you a free license key as a way of saying thank you. If you are running Microsoft Windows Server 2008, it is strongly recommended that you upgrade to Microsoft Internet Information Services (IIS) version 7.0. It significantly increases Web infrastructure security. The 500 Internal Error is in many cases out of your control, but you should know that the web administrators are working on it. So it is suggested that you come back and have a try later. The problem could be fixed already. .htaccess on your site might interfere with the web page that you are tying to load. Please double check the .htaccess configuration for any possible syntax error that could render a 500 Internal Server Error. You can also try to rename or remove the .htaccess file for the time being to see if the error persists. If your PHC script makes too many time out external network connections, the 500 Internal Server Error could occur. To prevent the time out, you need to make sure that the PHP scripts are coded with certain timeout rules. It is suggested that you remove any external connections. This will help you increase the performance of your websites and decrease the chances of getting a 500 Internal Server Error. If your web pages ending with .cgi or .pl are having this error, please check to troubleshoot possible syntax or coding errors on your script.